Him: You are a butterfly, flitting about from here to there, I can't catch you. Me: OK. Don't worry about it. I will keep you in the loop. You will always know what you need to know. That was the first time I had heard that, but he was right. I am a butterfly. He didn't fire me, but on the other hand, it never occurred to me that he might. I am a butterfly. And butterflies were meant to be free. Being a butterfly isn't always easy in a world that loves to put people in boxes and containers with nice safe labels on them. Have you ever tried to put a butterfly in a box? Please don't, because a butterfly will die in a box. I will die in a box. I navigate this world of boxes and labels, carefully moving in and out of them before it's too late because the world that I live in needs predictability. And I need the opposite. I need to be free, to feel, to explore, to be. To feel. I am a feeler. And I have been pretty successful as a feeler. In my corporate life, I made a career out of being able to be a butterfly on the wall in boardrooms of executives who postured and politicized and pontificated possible futures. (That's a lot of p's for 6 AM) I would listen and watch, and sometimes write things down to let them know I was listening (that was the fitting in part, not the flying part) and then I would sit down and write exactly what they meant to say in such a way that they would read the words and say yes, we said that. And that was my career. I loved it. And then one day, when I was 45, I came to the realization that I was in a box. That the lid was about to close. That I would suffocate. That I would die. I confessed to my boss - the one who 'labeled' me a butterfly - that this "situation" was not sustainable. That I had to make changes. To be honest, at the time, I did not know what that meant, but I knew deep down in side in my butterfly heart that I was one unhappy being. I wrote this one morning at 3 AM. By my staying the same. Where lives my potential, my voice. But I don’t know what to say. My voice had become dormant during the years of being "somebody's something" - daughter, sister, mother, wife, employee, planner, facilitator, worker - which really began when I was born and persisted until I was 45. There inside the Belly of the Great Whale, a metaphor that describes my life at the time, I realized that I had been swallowed whole by my work and my life, and I had to be free. Claustrophobia saved my life. I remember the feeling of a pounding deep within my chest, the shortness of breath . . . I was suffocating her. I gave myself one year to change literally everything in my life - from my hair to my job to my body to my . . . whatever else to find my way out, to find my voice. I knew I had to do this alone. This was my secret, because everyone around me had something to lose by my changing. I gave myself some guiding principles to stay grounded through this transformation. 1. Practise three acts of defiance each day. 3. Listen and seek to understand the secrets of the universe. 4. Avoid rooms with no doors. I began writing every day just to listen to what I was saying inside of me. To capture whatever it was that was inside of me at that moment. I committed to a time frame of 3 to 30 minutes to avoid the trappings of my obsession with perfectionism, (which I now understand to be nothing more than a severe lack of confidence and an expression of self loathing). I would sit in the dark in my home office, close my eyes, and write whatever was inside of me. Not what I was thinking, but what I was feeling. I would save the writing, close my computer (that was the practicing imperfection part), resisting the urge to go back and edit. Perfection was not the point. The point was to discover what had been locked away . . . to find the butterfly and let her out. She did find her way out, and now she can never be contained again. Or she will surely die. Sometimes I hear that pounding deep within my chest. Sometimes I can't breathe. It's her way of telling me that I am drifting back into captivity. Other times, I feel others screaming for freedom, trapped in side their own belly of the great whale, suffocating in decisions and choices of long ago. It makes me sad. And it reminds me that we are not alone. That we were all meant to be free. That life is only what we make it. That love is just love. That the voice inside is the one that we must hear. That we must let it out. These are things I know for sure. That life is too short to fade away into the background of time. That life is too short not to ask for what you want, and expect it. That life is too short to wait, and wish. That there is a price to pay, but the time spent wishing is a greater loss. Living an Audacious Life, in Shoes. I am just flying home after a week in Vancouver, visiting inspiring shops, and buying shoes for the fall season. This is our third buy since taking over the store and giving it a new life. 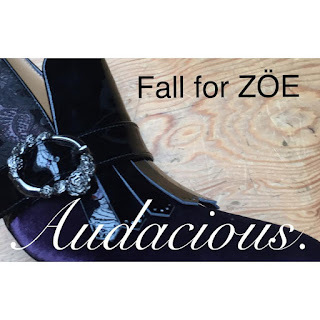 The word for this fall season is "Audacious". To have the audacity to stand up and stand out in your own personal vision of who you are. To have the audacity to walk into a room and own it. To have the audacity to know what you want, and to go for it, unabashedly. To have the audacity to fall in love, and learn to land on the way down. To have the audacity to . . . you. Everyone asks if this is my dream come true, and I guess on days like this it is.